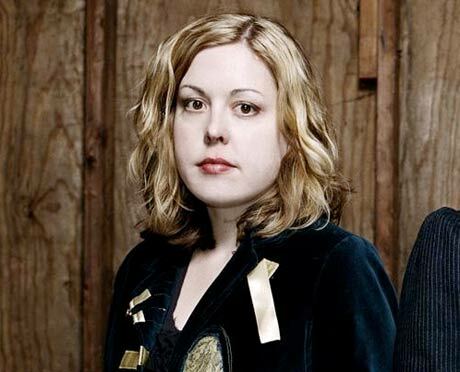 Sleater-Kinney's Corin Tucker Unveils Plans for "Middle-Aged Mom Record"
For fans of the indefinitely on hiatus Sleater-Kinney, it's been a tough couple of years: no tours, no recordings and only one casting in a feature-length film. Now, there's at least a little consolation coming, in the form of the debut solo LP by singer Corin Tucker. As TwentyFourBit reports, Tucker has confirmed that Sleater-Kinney's label, Kill Rock Stars, will issue her 11-song album later this year. As Tucker told the Portland Mercury, she hopes "to finish recording and mixing by June, and then hopefully put the record out in October." "I think some of the songs are in the ballpark [of Sleater-Kinney]," she explained about the album, before adding, "It's definitely more of a middle-aged mom record, in a way. It's not a record that a young person would write... There's some sadness, some reinvention, some rebirth. I think the goal for me is to write some good stories." While she admits a few shows might find their way into the mix, she won't be touring the album extensively. Below is a video from Tucker's performance at the Holocene in Portland, OR last year, where she debuted a number of tracks that may make the album.